As anybody in the events industry will tell you, there's no fool proof method for ensuring your event is a success, and goes off with a bang. If there was one, we'd be the first to tell you! 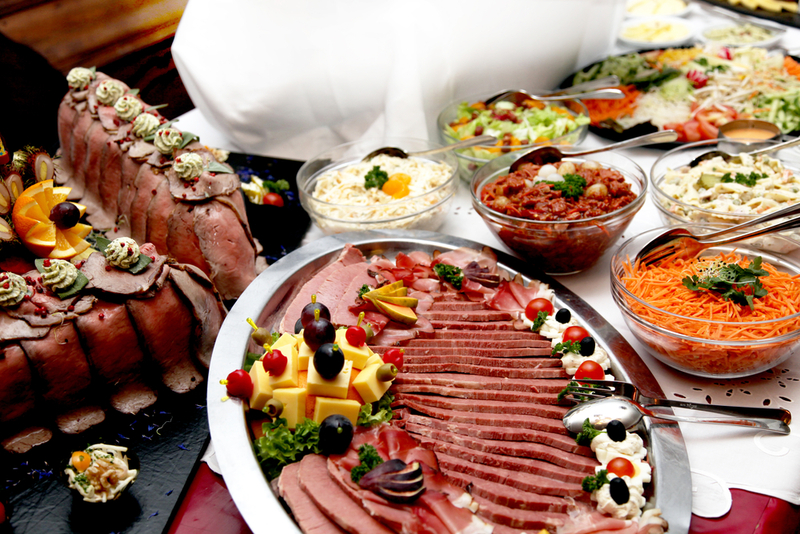 However, if you want to bring that memorable component to your event, you should be considering bespoke catering. The way to the heart is via the stomach, and food provides an extra level of sensory enjoyment that even the fussiest guest appreciates. We're talking big, bold, impressive displays of show-stopping gastronomy and themed dinners, designed to tie in with the concept of an event, and take the dramatic aspect of the evening up to the next level. There's simply no better or more effective way of heightening the overall experience, and making your social media credentials and event's online shareability go through the roof (because we all know how much people love to upload photos of their dinner). While we're sure you're more than capable of coming up with your own concepts and designs for event bespoke catering, we've put our heads together and dreamed up some concepts of our own to inspire you. Here are our favourite suggestions that we feel will be a massive hit for your event. ​This theme is your opportunity to bring out your spooky side, and incorporate a touch of the gothic and Halloween-esque into your Christmas party. Colour schemes should be black, white and ivory, with maybe a touch of red and green here and there, and involve a blend of Victorian Christmas style with plenty of horror elements. Use Ouija boards instead of placemats, have long candles absolutely everywhere, and really go to town with cobwebs, black furnishings, black velvet drapes and throws, and dramatic, atmospheric lighting. The menu for your ‘Nightmare Before Christmas’ bespoke catering event should combine elements of both Halloween and Christmas. Therefore, for entrees, we would suggest offering pumpkin and goat cheese pastries, along with breadsticks shaped like bones… or why not present a blood-red beetroot soup - not only delicious, but certainly also rather on the dramatic side! If you were hosting a Christmas party without at least some of the elements of a classic Christmas dinner, we think you’d end up with a riot on your hands. Therefore, get the roast chicken or turkey involved, along with all of the trimmings - we’re talking roast potatoes, roasted vegetables, stuffing, gravy, cauliflower cheese - but add a few spooky twists to the proceedings. Red wine gravy could be labelled as fresh blood, marrowbones could be added to the list of side dishes… use your imagination, and see where it takes you! The final courses of your meal should always be spectacular, and everyone loves a flaming Christmas pudding as a centrepiece. Go wild with candy canes, sugar skulls and spider web cakes, and see the smiles grow wider on your guests’ faces as they revel in this highly unusual themed dinner. Prepare your guest for a swashbuckling adventure on the high seas, as you transform your events venue into a pirate ship, complete with Jolly Roger flags, rigging, parrots and a plank to walk if they behave badly. Drinks should be rum-based, the staff should be sporting the full pirate costumes (wooden legs not strictly necessary…), and sea shanties should be ringing out across the room throughout the evening. 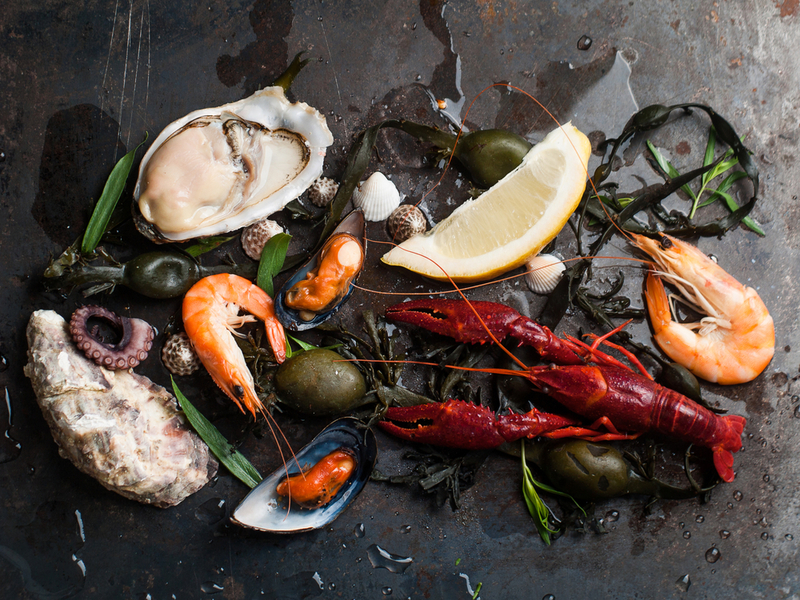 Obviously, a maritime theme should run through your evening, giving you the chance to really impress with seafood. A fresh oyster bar is never a bad idea, and you can provide your guests with a choice of toppings for these wonderful delicacies. King crab claws, lobster, caviar and blinis… even prawn cocktail would be fitting here. There are hundreds of fish dishes for you to choose from. You can keep things classic and go with everyone’s favourite - fish ‘n’ chips - or offer something a little more sophisticated, such as salmon fillets, sea bass, or monkfish. For those not wanting to eat fish, you can up the pirate theme by bringing in elements of Caribbean cooking, such as curry goat, or fried plantain and rice and peas. Your last course should have elements of the exotic southern seas. Mangos, coconuts, pineapples and other such fruits should feature prominently, and you have a lot of fun with Jolly Roger cakes, and similarly decorated desserts. Your attendees will be blown away by this theme, which intends of taking them through the ages in a time machine of a venue. Bring in elements of the ‘steampunk’ aesthetic - a curious blend of the Victorian and futuristic - and separate your venue into different ‘zones’ representing different time periods, for example, the distant future, the middle ages, the 1900s… you get the idea. 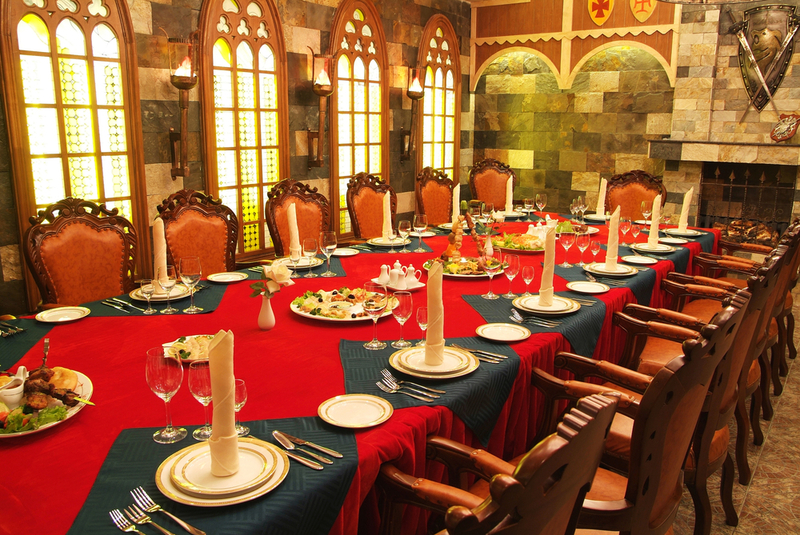 It would be a shame not to base your main course around a Medieval banquet, as there is probably no type of feast more iconic or awe-inspiring. Huge hunks of roasted meat, bread plates, pies and birds stuffed with other birds - if it’s dramatic, impressive and rustic, it’s on the menu! Here are some great ideas to start with. Take your guests into the future for your final course. Hire a liquid nitrogen ice cream maker - not only does it look amazing, with plumes of smoke coming from your bowls, it also tastes out of this world! Think Willy Wonka, and take your attendees to a world of ‘pure imagination’. 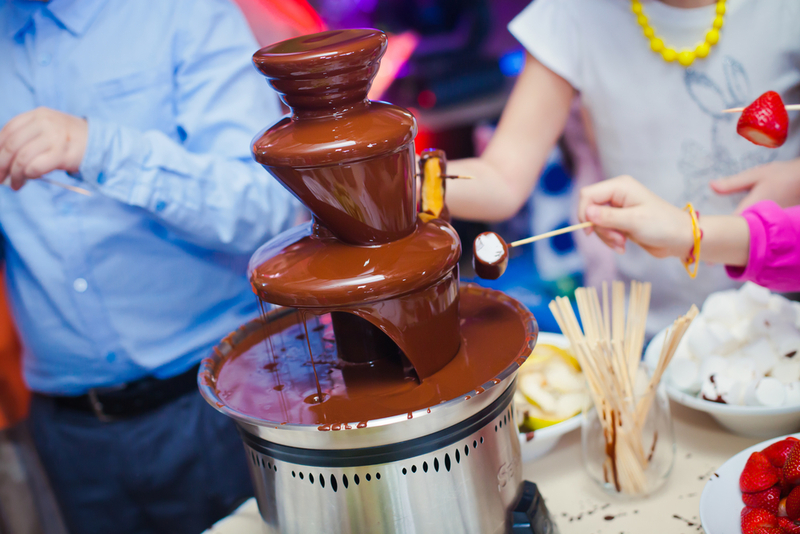 Chocolate fountains, sugar sculptures, edible decorations made of sugar paper and fondant icing… there’s so much you can do with this theme, and your guests are going to love wandering around your venue, nibbling their way around the room! We associate chocolate with the Aztecs and the other indigenous peoples of Central and South America. Once you start looking through their recipes, you’ll notice that chocolate is included in as many savoury dishes as it is in sweet ones, too. Use this as inspiration for your starters, and make a series of dips - white chocolate baba ganoush, for example, is particularly delicious, and who knew that bitter dark chocolate and roasted peppers was so good? OK - this particular bespoke catering and events theme was made for the dessert course. Triple chocolate puddings, churros served with chocolate fountains, a selection of chocolate truffles… need we say more? Let’s celebrate our European neighbours by bringing together the cuisines of different countries, and decorating our events space with some of Europe’s most iconic images. Have a photo booth at your event (always a popular feature) where guests can dress in traditional European costumes and have their photo taken, or corners dedicated to different capital cities - a Parisian section, for example, featuring local artists, a cheese bar, or images of the Eiffel Tower. Let’s kick this theme off with a northern European twist, and offer some Scandinavian delights for our entrees. Cured salmon gravadlax and open sandwiches, topped with on-trend pickles, fish, eggs and more - they look beautiful, and taste divine! Here’s a top list of wildly hip Danish sandwich recipes for your inspiration. 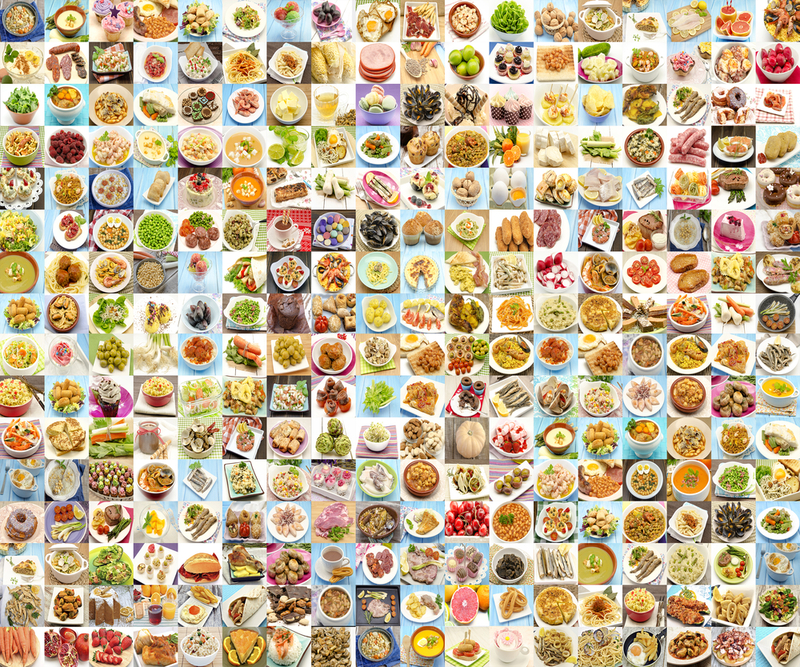 Let’s head to central Europe for the main course. German sausages, Wiener Schnitzel from Austria, and steaming bowls of Hungarian gulyás are sure to go down will with your guests, and perhaps open their eyes to new flavours and textures, too. Italian food, also, is always popular - but in order for this bespoke catering theme to work, everything has to be as authentic as possible; no pineapple pizzas, please! Where else could we go for dessert but France? Delicate cakes and créme brulée puddings are surely the only way to finish this elegant dinner, as well as a cheese course which selects delicious cheeses from France, Spain, Italy and the UK. So, there you have it - five great bespoke catering ideas for your next conference, product launch, end of year party or other corporate gathering. We hope you’ve enjoyed our thoughts on the matter, and that it’s given you some inspiration. Trust us - food is massively important when it comes to impressing, entertaining and bringing together your delegates, colleagues or guests, and this is a powerful way to make a big impact on social media, too. We’d love to hear from you if you’ve experienced any corporate event catering themes like the ones above, and we’d also love to hear from you if you’ve come across anything wildly different, or similarly cool. As always, let us know in the comments below! Next time you’re looking for some great catering for any kind of professional event, check out Create - the catering wing of the ever-inspiring Concerto Group. They’ve got everything it takes to make your event into the happening of the year!